Rachel Wade (born February 27, 1990) is an American woman who was convicted of murder in the second degree in the murder of Sarah Ludemann. Rachel Wade and Sarah Ludemann were romantic rivals. The rivalry began after Wade's breakup with Joshua Camacho. Camacho began seeing Ludemann, much to Wade's displeasure. In the first six months Ludemann was with Josh, Pinellas Park police officers spoke to Wade six times regarding public confrontations with Camacho. She got into a verbal argument with the mother of Camacho's child. Camacho punched Ludemann in the face, but Ludemann did not press charges. Wade left insulting voicemails for Ludemann. Their rivalry quickly turned violent. They began to harass one another and, according to Wade, Ludemann would show up at an Applebee's where Wade worked in order to taunt her. During one incident, Ludemann told police that Wade repeatedly called her cell phone and left threatening voicemails. The rivalry deteriorated until Ludemann's death. On the evening of April 14, 2009, authorities say that Rachel Wade was alone in her apartment waiting for Joshua Camacho. Camacho was watching movies with Ludemann. While Wade was outside walking her dog, she heard a car honk and she stated that Ludemann yelled, "Stay away from my man!" Wade said that she was scared and she decided to call an old boyfriend, Javier. He told her to come over to his house. She got her purse, opened a kitchen drawer and pulled out a steak knife. At 11p.m., Wade approached Camacho's house. He and Ludemann were inside playing video games. Wade sent Camacho a text message saying, "Now I know why you're not talking to me — because you got her." Camacho replied, "That's right. I don't like you no more, why don't you go home?" Wade responded, "No. I'll wait for her to go home." Witnesses later testified that they overheard Wade threaten Ludemann on speakerphone, "I'm going to stab you and your Mexican boyfriend." Just before midnight, Camacho's sister asked Ludemann for a ride to McDonald's. Ludemann saw a friend at a stop sign who told her Wade was at Javier's house. Ludemann decided to confront her. As she was driving, Wade called her and yelled, "I'm going to kill you! You and your Mexican boyfriend!" Ludemann arrived at Javier's house and saw Wade speaking with him and their friend Dustin Grimes. Wade testified that Ludemann slammed on her brakes, nearly hitting Wade and storming out of the car with her fists flailing. Wade said that she was fearful when she stabbed Ludemann's shoulder and chest, one blow punctured her heart. However, authorities and the prosecution's witnesses said that Ludemann did not get a chance to leave the van and that it was Wade who approached and attacked Ludemann. Ludemann, mortally wounded, and clutching her chest, called Camacho to tell him what happened. Camacho ran to Ludemann's home to tell her father. They both drove to the scene. Immediately after the stabbing, witnesses say that Wade threw the knife over a neighbor's house and calmly said, "I'm done." Ludemann bled to death long before police and paramedics could arrive at the scene. Ludemann died as a result of a heart puncture at a hospital and was pronounced dead at 2:20 AM the next morning. Police arrived and began questioning Wade and the witnesses. She began to cry when they told her Ludemann died. Hours later, Wade was arrested and charged with murder in the second degree. She was booked into the Pinellas County Jail on $500,000 bond. She stayed there through the conclusion of the trial. TruTV's In Session televised the trial which began on July 20, 2010 with jury selection. After television coverage ended at 3pm each day, a live internet stream was provided by LIVE.CNN.COM. Testimony lasted 3 days from July 21 through July 23. Prosecutors brought up the history between the two in order to show that Wade intended to kill her rival over Joshua Camacho. The defense argued self-defense under Florida's Stand Your Ground law. Wade's attorney, Jay Hebert, stated that Ludemann was very upset and that Wade was fearful because Ludemann was bigger and her friends outnumbered her. Hebert brought up the Applebees incident in which Ludemann and her friends knocked Wade's tray over, sang Girlfight[clarification needed] during karaoke and taunted her. He also stated that the two girls fought before the stabbing and pulled each other's hair. The witnesses who testified for the prosecution were Joshua Camacho, his sister, and Dustin Grimes. Javier testified for the defense. Javier stated that the two fought, but admitted he did not see much of the incident. Camacho's sister and Mr. Grimes testified that Wade approached the vehicle and stabbed Ludemann. The jury heard the voicemails, which Ludemann saved eight months prior, in which Wade stated that she was going to kill her. This ultimately sealed her fate as the jury of 5 men and 1 woman took just 2.5 hours to find her guilty of murder in the second degree. 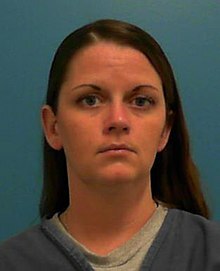 On September 3, 2010, Rachel Wade was sentenced to 27 years in state prison. The judge stated that he believed Wade intended to kill Ludemann. Wade maintained that she acted in self-defense, and appealed her case. She is housed at Lowell Correctional Institution. In a March 2011 interview with ABC News, she said that she believed that social media played a major part in the rivalry and murder. She stated that social media gives people the ability to say whatever they want with very little consequence. This case has been featured in Dateline NBC in February 2011, Deadly Women in November 2011, Facing Evil with Candice DeLong in December 2011 and on E! Entertainment Special's When Girls Kill. Charlie Ludemann, Sarah's father, has filed a civil suit against Wade. On February 17, 2012, Wade lost her appeal. On October 7, 2012, Wade's case was also featured on the Oxygen shows Snapped, and Killerpost on February 13, 2016. On March 17, 2019, Wade's case was featured on the "Fatal Love Triangle" episode of the HLN series Vengeance: Killer Lovers. ^ a b DeGregory, Lane (July 16, 2010). "One teen boy, two teen girls, and homicide". tampabay.com. Retrieved October 20, 2016. ^ Waddell, Lynn (August 8, 2010). "Florida and the Love Triangle Murder". The Daily Beast. Retrieved October 20, 2016. ^ Huff, Steve (April 15, 2009). "The saga of Rachel Wade and Sarah Ludemann". True Crime Report. Retrieved October 20, 2016. ^ CNN Wire Staff (July 23, 2010). "Florida woman involved in love triangle guilty of murder". CNN.com. Retrieved October 20, 2016. ^ CNN Wire Staff (July 23, 2010). "'I never went after them,' love triangle stabbing defendant says". CNN. Retrieved October 20, 2016. ^ Wade, Kevin (July 23, 2010). "Rachel Wade found guilty". CBS News. Retrieved October 20, 2016. ^ CNN Wire Staff (September 3, 2010). "Love triangle killer gets 27 years". CNN. Retrieved October 20, 2016. ^ DeGregory, Lane (September 3, 2010). "Rachel Wade sentenced to 27 years in state prison". St. Petersburg Times. Retrieved October 20, 2016. ^ [dead link] "Wade to appeal murder convicton". WTSP. ^ [dead link] "Teen killer says social media led to murder". ABC News. Archived from the original on 2011-05-14. ^ Deggans, Eric (February 24, 2011). "Local love-triangle murder featured on 'Dateline'". St. Petersburg Times. Retrieved October 16, 2016. ^ DeGregory, Lane (April 12, 2011). "Father of murdered girl in love triangle case files suit against Rachel Wade". St. Petersburg Times. Retrieved October 20, 2016. ^ "Welcome to the Florida District Courts of Appeal Online Docket". 2nd District Court of Appeals. Archived from the original on 11 December 2003. Retrieved 14 July 2012. This page was last edited on 25 March 2019, at 06:58 (UTC).